I remember someone on these boards basically claimed that any Starfleet officer who didn't rise up to the command ranks was an abject failure, and that there was no point to them ever having joined Starfleet in the first place. But that's not realistic. After a certain point, promotions no longer become automatic; selection becomes more rigorous. The command grades also carry an extra level of responsibility that not everybody is suited for. And that's just fine. Absolutely. And there's a thing called The Peter Principle that states people will get promoted to their level of incompetence. Someone might be a great technician, a good trainer / front-line supervisor, but only marginal as a manager. The question become: what do you do with him now? You can't really promote him to superintendent, where he can really mick things up. You can't demote him back down, and if you let him sit there forever, it causes a bottleneck blocking others from moving up. The only real answer is to force him to step aside at some point. In the real-life navy, many officers are quite content to spend their careers in the Lieutenant grades, and then retire. You can't do that in today's US military. We have (for now) a fairly strong Up-Or-Out policy. Unless one is prior-enlisted, you pretty much need to make O-4 Major / Lt.Commander to go a full twenty years. Gabriel and Lance like this. Yes this is reality. My Dad made it to Captain (Army) and that was after a career of many years determined to be non-commissioned. As others point out, yes Kim never got promoted, but he was basically chief of ops for the whole journey and got to sit in on senior staff meetings despite his low rank. Not even Acting Ensign Crusher was ever allowed to sit at the table unless his input was specifically mission relevant. Harry's only an Ensign but he's basically doing what was Data's job on the Enterprise. Treklit suggests two ranks (skipping LTJG), which is actually consistent with 8-9 years for promotion to LT averages from Datalore. Other promotions include B'Elanna Torres (from LTJG to LT CMDR), Chakotay (LT CMDR to CAPT), Tuvok (LT CMDR to CMDR), Paris (LT to LT CMDR). However, the largest promotion was of course Janeway herself who was promoted at least three grades (to either Vice ADM or the more senior Fleet ADM which erroneously shares the same insignia (it should either four or five enclosed pips). Phaser Two and Nerys Myk like this. I'd think she'd be in Georgia, by now. I think there should be less of a stigma on that. It's associated with failure, but that's not necessarily shameful. Not everyone is suited for each role. For example I've known people who were excellent technicians, and were 'promoted' to include management responsibilities, which made them deeply unhappy (and far less efficient). Some of them would have been happy to step back in their old role, but of course they couldn't. But because it couldn't be reversed in effect they had to leave the company. So everybody loses. As for the more general topic, I wonder what would happen in a real-life situation. Because of the state of technology it's almost impossible nowadays, but what would really happen if a 150-ish unit of an army got isolated from upper command for years on end. Would standard promotions be handed out when they were due or would everything be put 'on hold'? However, the largest promotion was of course Janeway herself who was promoted at least three grades (to either Vice ADM or the more senior Fleet ADM which erroneously shares the same insignia (it should either four or five enclosed pips). Well, "Fleet Admiral" in the TNG and DS9 context seems to denote Admirals who get to command Fleets. The rank sufficient for that seems to be two or three boxed pips. The rarely seen five-pip Admiral rank is not given a formal name in any era, not even the TOS movie one where the actual brass is in the form of that ornate star that at least three major supporting characters get to wear. We would probably do well to assume it's not called Fleet Admiral. Grand Admiral, perhaps? Janeway isn't the only one to skip right to Vice Admiral, of course: Pike in the Kelvinverse does the exact same thing. Perhaps flag pips are "cheap", and are dished out to match the job openings at hand? That is, if you have earned one boxed pip, you have earned at least three, and the number you get to wear to the office on Monday depends on whether the organization needs a leader for the 2nd Fleet or a commandant for the Academy (two or three pips) or a commander for Starbase 666 or Sector 12345 (three pips) or just a lowly Chief of Starfleet Operations (only two pips, for reasons left unclear in ST:TMP). The only canonical appearance of a five-star admiral was the "Commander in Chief, Starfleet" and maybe other senior members of "Starfleet Command", so it's likely to be purely positional. Janeway isn't the only one to skip right to Vice Admiral, of course: Pike in the Kelvinverse does the exact same thing. Perhaps flag pips are "cheap", and are dished out to match the job openings at hand? In the US armed forces, only one or two star ranks are permenant (vice admiral and above are determined by posting, and in the Royal Navy there are "officers of flag rank" (anyone above commodore) and "flag officers" (select strategic commanders only) . In the USAF, we have company-grade officers (O1 - O3), field-grade officers (O4 - O6), and flag officers (O7 - O10). It seems sort of silly that we have "company-grade" officers when we don't have companies but rather flights and squadrons. Apparently, the full Grand Admiral Supreme decoration is worn by four in-focus characters in total: Morrow in ST3, Cartwright in ST4, "Bob" in ST5 and "Bill" (plus Cartwright) in ST6. None of these is addressed by exact rank, and two go by their first names, so the super-star pin might be a rare phenomenon indeed. While the top position may come and go (Cartwright is no longer the highest of the high in ST6, but not retired or disgraced, either), the super-star apparently stays (with Cartwright at least). Might mean that the third-from-top deserves the pin as well. Or that once you get it, you also get to keep it as a memento. Or both - but even with three or four people wearing it as a sign of their position at any given time (or just at the time of a lukewarm state of war with the Klingons? ), the total number of people entitled to wearing it overall might be manageably low. Regarding Harry's role as Ops Chief despite his low rank - remember Voyager was only supposed to be out for a few months at most on what was considered a milk run assignment. Perhaps Starfleet decided to let some younger high-flyers get a bit of experience under their belts by slotting them into bridge officer roles, with the expectation of reassigning them once Voyager got back (or promoting them if Janeway wanted to keep them in place)? But Starfleet did not make Ensign Kim the Chief of Ops. When the ship sails out, Harry Kim is merely an "Operations Officer", never stated to be the Chief of his department. A bridge officer nonetheless, of course, and apparently immediately put to the test. But just like Ensign Chekov from a Navigation department that featured several Lieutenant characters, he's qualified to do the job without having to be the boss. I think that Chakotay was initially planned to be a Lt. Cmdr, but they ended up making him a full commander without changing his rank insignia. This way, when Tuvok gets bumped to Lt. Cmdr, he's not outranking the XO. On the Enterprise, the only commanders onscreen were Crusher, Riker and Troi in the sixth or seventh season, after her holodeck test. I always thought it made perfect sense for Crusher to be a full Commander and get to have Bridge watch duties, mainly due to the fact that as Chief Mefical Officer, she would have a great deal of experience in not only triage, but also having to make quick, thoughtful decisions in a crisis where lives are at stake. If there is one person outside the command structure that would be qualified on that merit alone, it's her. Well, I have read somewhere that a Commander was inevitably chosen by the Captain, among the Lt Commanders onboard. The laureate is supposed to have followed a command training or at least, already showed at various occasions, some leader capacities. Here - and even if I disagreed with that -, the choice of Chakotay as her XO seemed logical: not only as a former senior officer and command trained, he had the capacities and experience to hold the position of Second in command but for tactical (she had to alienate the Maquis crew to her own crew), she was forced to appoint him to the position of her First Officer, even if according to Starfleet protocol, she deliberately violated it (Chakotay, as a resigning former senior officer, would never have held this position, especially when we have a Tuvok, an already Second Offcier - after Cravit - and a very experienced senior officier in activity, who had all legitimacy to hold the position -> Tuvok WAS Lt Com in Caretaker then suddenly, the rank disappeared to re-appear sometimes later -> in the french dubbing, Tuvok is called Commander then Lt then again Commander). 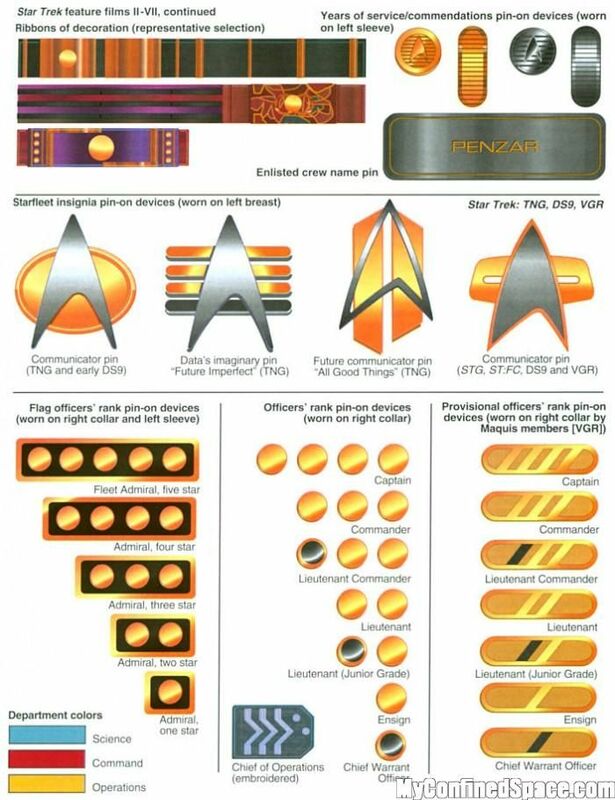 About the insignia all Maquis officers wore at their necks, I think that it was more a distinctive sign, a way to show that they didn't want to be confused with Starfleet crew, even if at the end, we saw only their uniform, some Starfleet standard ones that Janeway has forced them to wear. -> could you see/read ranks on the insignia the Maquis crew wore? I was unable to do it while pips were clearly "readeable". Prob harder to see on SD TV, but should be mostly visible on DVD. The unique rank means that they're "provisional", meaning pending confirmation by Starfleet HQ. In actuality, the producers wanted the audience to be able to tell at a glance who was maquis and who was 'natural-born starfleet' with everyone still wearing the same uniform. So random extras would get the maquis collar and others would get the starfleet collar. If Starfleet is patterned after real militaries, Kim should have been promoted at least twice due to Time in Service/Time in Grade, automatic promotions with a good service record. I would think also that starship libraries would have test material, and testing means for promotions, and given the nature of space exploration, provisions and directives for long term loss of access to Starfleet subspace networks should be in place for promotions. Plus the commanding officer has the authority of field promotions. Kim should have been promoted. Unless he harmed a Delaney Sister. Comes down to sloppy world building. I've always considered that Janeway cannot give a promotion by her own volition. Starfleet Command gives them. Tuvok probably had a promotion pending on the success of his undercover mission but, considering the circumstances, Janeway didn't give it until the two crews had merged into one and worked together well. Can you imagine how life on Voyager would be had she said "BTW, Tuvok, hereby you get a promotion because you did such a stellar job in duping the Marquis and helped Starfleet capture them"? As it was she gave provisional (or fake) field rank to the Marquis (so the viewers can identify and separate them from the Starfleet officers) and re-instated Paris' rank (also with a field aka fake commission), probably so he could be assigned to the conn, much like she made B'Ellana (who never even finished the Academy) a Lieutenant once she gave her control of Engineering. If and when they made it back to Earth those ranks would be stripped, the Marquis and Tom would be marched back into prison and she would submit logs and requests for the 'fleet crew to receive any promotions. So, aside from morale, what's the point in her giving out promotions if they'd be stripped when they went back to Earth?